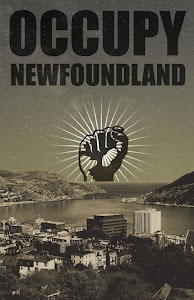 Occupy Newfoundland and Labrador: University Tuition in Canada: some historical perspective. 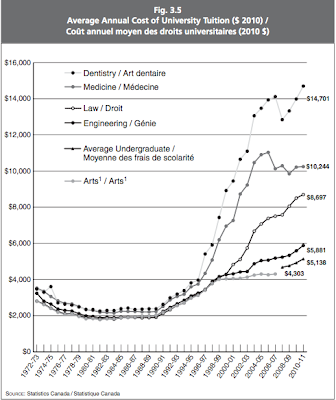 University Tuition in Canada: some historical perspective. A recurring argument in news commentary about the Quebec student strike is that Quebeckers pay the lowest university tuition in the country so they have no justification to protest tuition hikes. These commentators tend to frame prevailing tuition rates in Ontario and BC as "normal", and thus the Quebec tuition rates as abnormally low. I think a little bit of historical perspective is in order. Here is a chart presenting average annual tuition and fees for bachelor's degree programs in Canada's four largest provinces (plus NL). 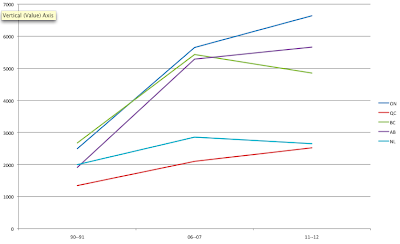 The figures are corrected for inflation, in constant 2012 dollars. My reading of this graph is that tuition has jumped to abnormal levels in most of the country. Current rates of tuition would place Quebec (and Newfoundland) in the middle of the pack of Canadian provinces in the early 90s. The proposed rate hikes would put Quebec well above what were considered "normal" tuition rates 20 years ago. It is a shame that our senior columnists and media pundits - the overwhelming majority of whom received their university education before 1990 - are unable (or unwilling) to recognize these simple facts. 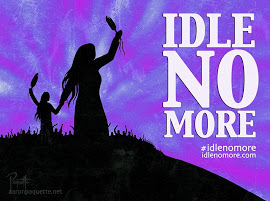 Data sources: CBC News here and here. Update: Someone told me about a terrific source of data here. 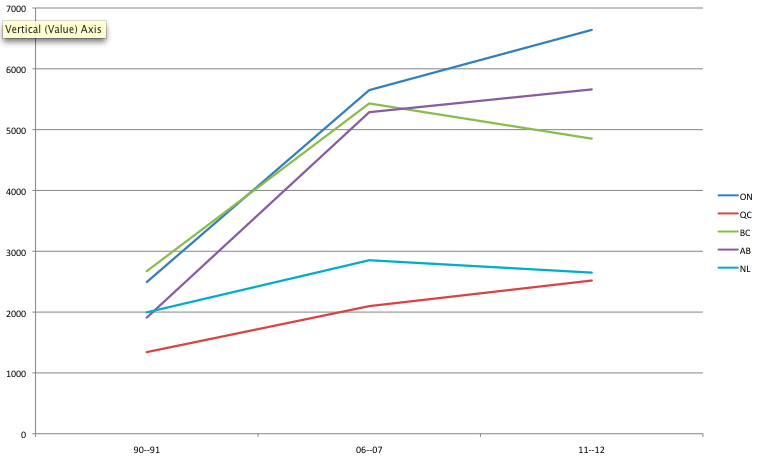 Some complementary graphs. 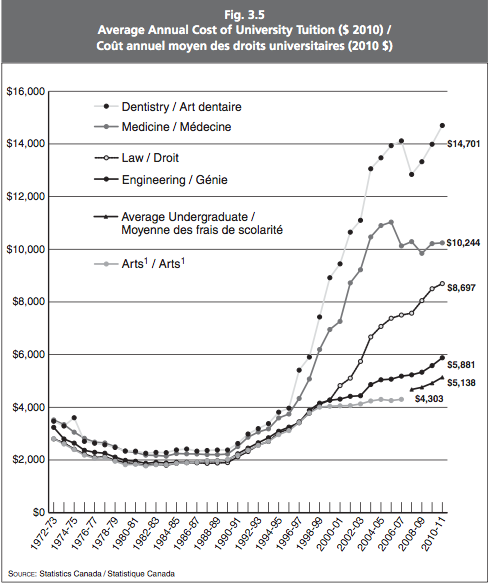 First we have average university tuition in Canada, corrected for inflation in 2010 dollars. Tuition for a bachelor of arts was steady through the 80s and then more than doubled since 1989. Tuition for professional degrees increased even more dramatically. Next, we see that tuition has also more than doubled as a share of university revenue since 1989, filling the gap left by falling government spending. Lastly, we have the tuition share of revenue broken down by province. By this measure, we see that Quebec tuition today is about what was normal in the rest of Canada in 1989.